Every year, innumerable road accidents and deaths take place due to distracted driving. Large number of studies shows mobile phone usage while driving was the major reason for distracted driving. With the aim of preventing road accidents due to mobile phone usage while driving, we propose a highly efficient automatic electronic system for early detection of incoming or outgoing call, an antenna located on the top of driver seat used for detecting when the driver uses mobile phone and a low range mobile jammer with its range covers only driver seat which prevent drivers mobile phone from receiving signals from base stations. 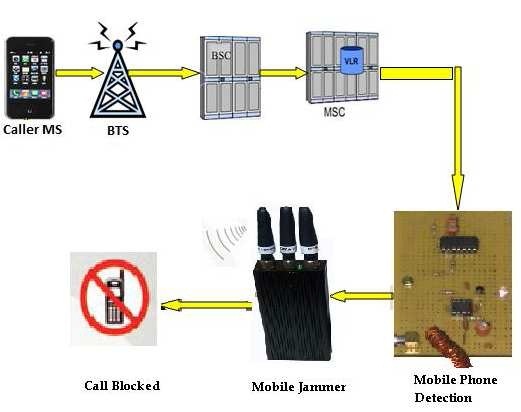 Keywords: - Mobile Phone Detection, Risk of using mobile phone while driving, Mobile Jammer. Over the past 20 years, hand-held mobile telephones have emerged as a road safety problem. Research (1, 2) has shown that the reaction time of drivers increases by 0.5 to 1.5 seconds when they are talking on handheld phones, and drivers have difficulty maintaining the correct positions in their lanes, maintaining appropriate speeds and judging and accepting safe gaps in traffic. Some evidence indicates that drivers who use hand-held phones face a risk of crash four times higher than risk faced by other drivers, imperiling themselves and other road users (3). Hands-free phones can also distract drivers, but the current evidence suggests that hand-held phones pose a greater problem (4). Many different studies have shown that when drivers use a cell phone while driving increases the accident risk (5, 6, and 7). This risk also extends to pedestrians (8, 9). For example, it is estimated that mobile-phone use for one hour a month increases accident risk by 400–900%. Other studies show that a high percentage of accidents among youngsters are due to mobile phone use (10). The increased accident risk is due to the fact that drivers using the phone are distracted from their main task, resulting in slower reaction time which leads to accidents. The circuit is mainly designed to activate the low range mobile jammer (covers area of the driver seat) for a while whenever the driver gets any incoming call or he tries to make outgoing call. An electronic circuit shown in figure 2 was designed for automatic detection of incoming & outgoing call on driver’s phone. Though various commercial systems do exist for detecting mobile-phone use indoors, and these could theoretically be implemented in a car. The trouble is that these Commercial systems are not able to discriminate mobile-phone use by a passenger instead of the actual driver. The biggest problem for the system is posed when phones are used by all passengers except the driver. In this case, the detection system was able to discern that it is not the driver who is using the mobile phone. This circuit will get triggered ON when the vehicle gets started. In this circuit we need two power supplies. Majority of the ICs are worked on regulated DC power 5v with GND. While Relay drive worked on DC 12v with GND. This power supply unit consists of transformer, rectifier, filter & regulator. AC voltage typically 230v RMS is connected to a transformer which steps that AC voltage down to the level of the desired AC voltage. A Diode rectifier then provides a bridge rectified voltage that is initially filtered by a simple capacitor filter to produce a DC voltage. This resulting DC voltage usually has some ripple or AC voltage variations. The output voltage from the capacitor is more filtered and finally regulated using voltage regulator, which maintains the output voltage constant irrespective of the changes in supply variations, load variation and temperature changes. Here we use one fixed voltage regulator namely LM7805.The IC 7805 is a+5 voltage regulator. The RF amplifier circuit can detect both the incoming and outgoing calls, SMS and video transmission even if the mobile phone is kept in the silent mode. The moment the bug detects RF transmission signal from an activated mobile phone, the LED blinks and it continue until the signal transmission ceases. Here the circuit uses a 0.22μF disk capacitor to capture the RF signals from the mobile phone. The disk capacitor along with the leads acts as a small gigahertz loop antenna to collect the RF signals from the mobile phone. The combinations of both antenna and rectifier produce a direct current. Op-amp IC CA3130 is used in the circuit as a current-to-voltage converter with capacitor connected between its inverting and non-inverting inputs. The rectified DC voltage is stored in a large capacitor and is digitized by an analogue–digital converter (ADC) for subsequent storage and processing using a microcontroller. The voltage obtained with this system depends, among other factors like, Signal strength, on the distance of the phone from the antenna and the relative orientation between antenna and phone. This part of the circuit should be placed inside the vehicle; on the top of driver’s seat to receive the RF radiation emitted by mobile phone. This set-up facilitates more trustworthy discrimination of driver use of mobile phone. The output of RF amplifier stage is given to PIC16F917 microcontroller which executes the voltage analysis algorithm. 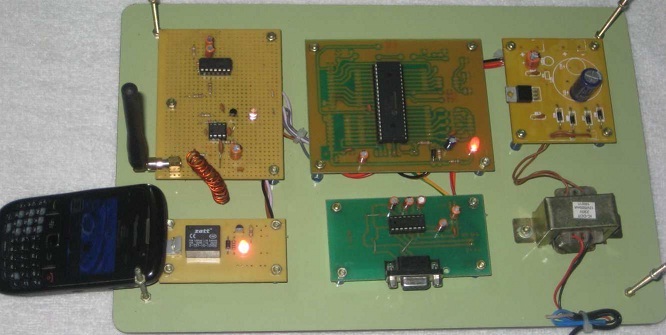 The microcontroller is programmed in such a way that, once the voltage level obtained from the RF amplifier stage is greater than voltage value stored in EPROM of microcontroller, it will activate the jammer which will prevent cellular phones from receiving signals from base stations. Furthermore the algorithm’s output is transmitted to laptop for recording and further analysis using MAX232 which is an integrated circuit that converts signals from an RS-232 serial port to signals suitable for use in TTL compatible digital logic circuits. In this experiment, a call was made to the rear seat passenger and to the driver when the vehicle was moving. A placed above the driver’s seat captures more energy from a mobile phone over various open-air distances when compare to rear seat passenger as shown in graph (a) & (b). When the mobile phone is not in use, the energy captured is minimal. When a call is made, this energy is inversely proportional to the distance between the telephone and the energy-capturing antenna. Here, we have set threshold value as 100mv, once the signal received by the antenna exceeds threshold value a jammer will gets triggered which will prevent cellular phones from receiving signals from base stations. In the above circuit we have used low filter to suppress the false signal. 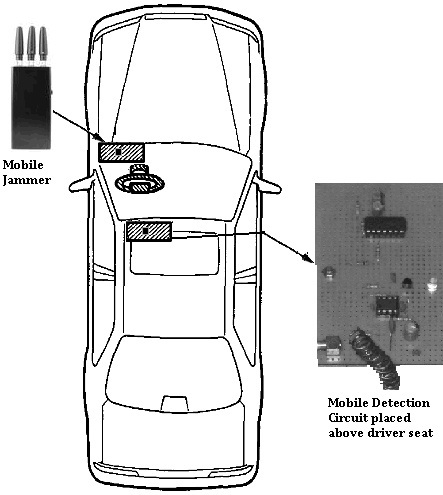 Figure 3 shows the vehicle’s internal structure with energy capturing circuit along with mobile jammer. When a caller initiates a call by dialing a number in his mobile it directly send a request to the BTS which he comes under. BTS there by sends the request to the BSC to which it is connected and from the BSC, the request is made to the MSC. Subsequently MSC sends a request to the HLR to check the information about the caller like account balance (if pre paid), area of the caller etc. After checking all the details the HLR sends a acknowledgement message to the MSC that the caller is O.K. to make a call or not. Once the message received by MSC it establishes an air link between the both parties and the call gets connected. When the phone started ringing it activate a jamming device which transmits on the same radio frequencies as the cell phone, which disrupt the communication between the phone and the cell-phone base station in the tower as shown in figure 4. Since the voltage captured by the energy capturing circuit exceeds threshold value it’s a called a denial-of-service-attack. Once the driver dials the number and press call button the mobile device will start transmitting more voltage. The energy capturing circuit captures voltage above the threshold value which results in activation of mobile jamming device which squeeze the RF signal as shown in figure 5. Which forces the driver not to use mobile phone while drive. 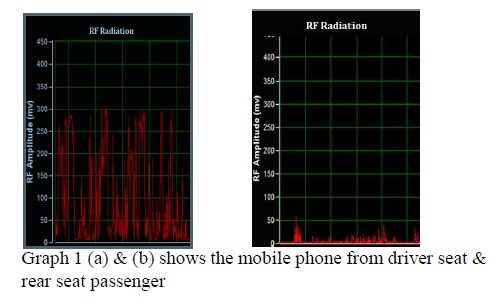 This paper presents a low-cost, non-invasive, small-size system and a jammer which helps to detect the driver’s use of mobile phone not the phone used by the fellow passenger in the vehicle. It also helps in preventing the road accident due to distraction to a large extent. Though Engineers, researchers or scientist innovate various new technologies, methods or system to prevent road accident, but still road accident continues. To overcome this type of situation all people must educate, realize and give more attention along with newly innovated technology to decrease the rate of road accident. Alm H, Nilsson L. Changes in driver behaviour as a function of handsfree mobile phones: a simulator study. Accident Analysis and Prevention, 26:441–451. Redelmeier DA, Tibshirani RJ. Association between cellular-telephone calls and motor vehicle collisions. New England Journal of Medicine, 336:453–458. The risk of using a mobile phone while driving. Birmingham, Royal Society for the Prevention of Accidents.